Maple syrup reminds me of my years growing up! We always made our syrup and to tell you the truth, I never even knew that you could buy syrup until I went to girls camp. I wasn’t very fond of the store bought maple syrup that we had at girls camp because I was so use to having the homemade. Now that I am a mom, I have always made my syrup as well. The recipe for this maple syrup is on the back of the Mapleine box and it is just so easy to make. But I thought that I better put it on here so that my kids can have the recipe if they ever forget it. We love to put it on pancakes, waffles, french toast, and even cornbread. It is truly delicious whatever you put it on. Wouldn’t it be great if you could turn back time sometimes, even for a day. It is so strange to me when I go back to where I grew up and it seems like things should be the same. The same houses, the same stores and the same people. The land is the same, but there are a few new homes and a few of the same people. However most of the people, look a little, or even a lot, different. It is always fun to run into old friends and family. I came from the country and now I live in what I call the city. We have houses on every side of our home. When I was growing up the home that was nearest to ours was across a State highway, and then the next closest house was about a mile away. I did love that growing up, but now when I go into the grocery store to find something, I am spoiled. If one grocery store doesn’t have it, I just go down the street to the next grocery store. I now have about twenty grocery stores that I can choose from, compared to one or two if we were lucky, where I grew up (we bought a lot of our groceries in a small town which was 15 miles away). There just weren’t that many people, the population was 1000, and I didn’t even live in town. But every place that one lives has its pros and cons. I do miss the quiet, and the slower pace of life. If I go outside, there is always someone around. Where I grew up it would be you and the cows, or a dog or cat. I guess a person could get use to whatever the circumstance. I told my husband that it was time to move closer to the country, but then I go visit and wonder, could I really do it? Yes, as I am getting older, I think that I could really enjoy a slower pace, and maybe a little more wide open space outside. But for now, I will enjoy the grand kids and I will be happy where I am, because I have learned, if you aren’t happy now, you most likely aren’t going to be happy somewhere else. I love the saying “the grass is always greener on the other side, but you still have to mow it”! I am reminded that each day is a gift, and we really just need to appreciate all that we have. I also thought about all the new people that I have met through the years and if I hadn’t found new friends, I would really be missing out knowing a lot of really cool people. How I am grateful for wonderful parents who raised me and taught me how to work, how to make a difference in the world, and how to get along with people. I am also grateful that my mom taught me how to make good old fashioned maple syrup. Enjoy! In a medium sauce pan boil the water. Once the water is boiling, add the sugar, and stir until the sugar dissolves. When the sugar is dissolved, add the flavoring and stir for about 1 minute. Place into a container that is easy to pour out of. This syrup is thinner than the ones you buy in the store. Here are a few links to some of our recipes that you may want to try this syrup on! 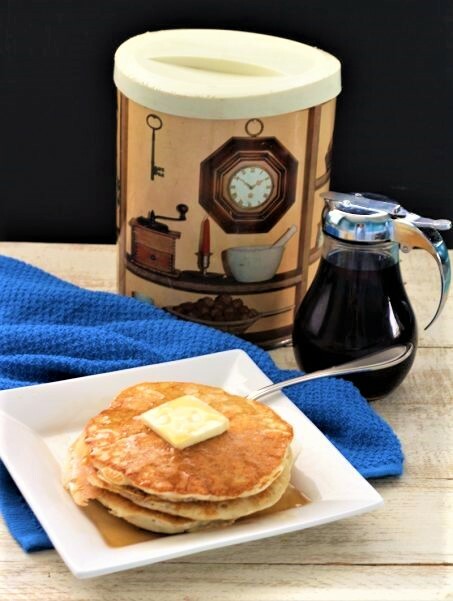 We love our buttermilk pancake syrup, but maple is excellent too! !